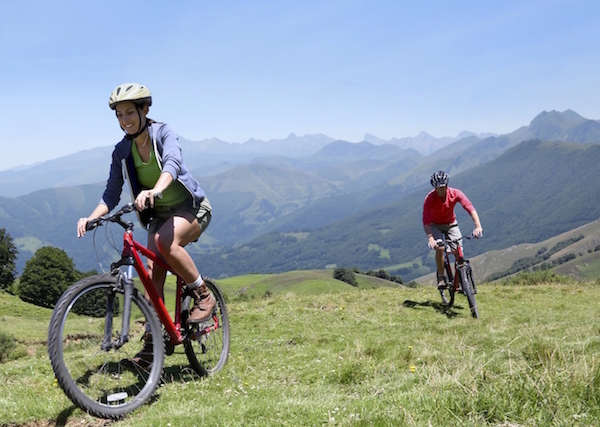 With an extremely varied territory, routes connecting distant areas and – what’s most important – its amazing landscapes, Italy is the ideal destination for cycling enthusiasts. From the north to the south, Italy offers unexpected surprises and incredible cycling routes. If you are considering a cycling tour in Italy (if you aren’t, well, you definitely should), these are the best cycling routes in Italy you shouldn’t miss. This cycling route covers the distance between Lake Garda and the Adriatic Sea (about 344 km), that requires more than one day: this can be the perfect idea for a short vacation on two wheels. You can start from Peschiera del Garda, to the south of the lake, and firstly reach the city of Mantua (45 km), one of Lombardy’s breathtaking little jewels (but don’t miss a stop in the beautiful village of Borghetto sul Mincio too). From Mantua you can reach the well-known city of Ferrara (90 km). If 344 km is too much for you, as an alternative from Peschiera del Garda you can reach the romantic Verona (34 km). 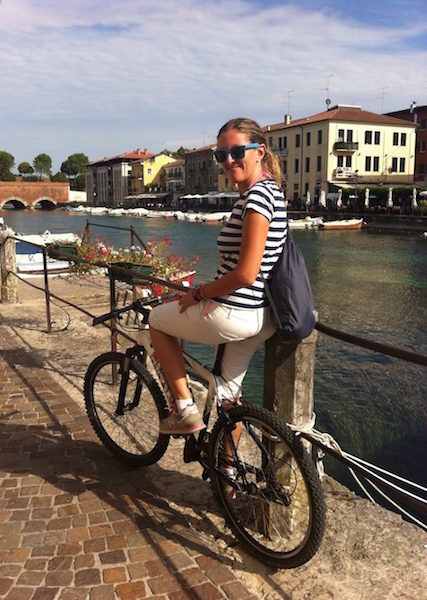 Claudia on her bike in Peschiera del Garda. This cycling route passes across Campania, Basilicata and Apulia, in the south of Italy, and connects Naples to Bari. The route is mostly flat and 334 Km long. This route is particularly enjoyable because of the landscape – beautiful and varied – and the climate, which is mild every month of the year. You can also decide to cycle between Bari and Matera (80 km) and then to Naples again. Dividing the route into different stages is particularly easy. 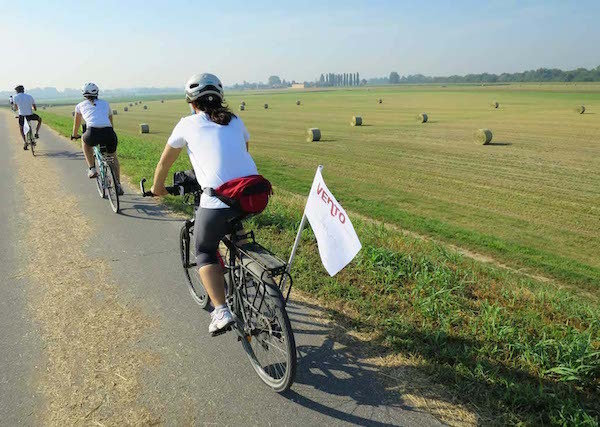 Its name is Vento – which means “wind” in Italian – and the explanation is easy: this cycling route connects Venice to Torino along 679 km. 102 km can already be pedaled but the finall project is still in process. In a close future it will be possible to go by bike from Venice to Turin, which means to cross all northern Italy, from the east to the west or vice versa. Among countryside views, typical farmhouses and small villages, the landscape is amazingly beautiful: a good opportunity to explore Pianura Padana, the Plain of the Po River. Thanks to its magnificient position, in the middle of the Dolomites, the Pusteria Valley has incredible views perfect for mountain lovers. Pedalling along its famous cycling route is quite easy because of the slight difference in height. Your ride starts from Rio Pusteria and ends in Lienz, in Austria, for a total of 105 km. Many the facilities along the way, so that it’s easy and convenient to break up the routes in different stages. At the end of your ride, if you are too tired, you can go back by train and carry your bicycle with you. Vento cycling route connects Venice to Turin. Another of the most amazing cycling tours you can have in Italy takes place along the river Adda, in Lombardy. You can leave from Lecco, flanking the magnificent river Adda all the way following its placid flow. You can stop in small fishermen villages like Brivio and Imbersago, visiting the Leonardo da Vinci’s Eco Museum until you reach Trezzo d’Adda (34 km) and the XIX century industrial village of Crespi d’Adda, Unesco World Heritage. But there’s more: from here you can take the Naviglio della Martesana canal and reach the center of Milano (35 km). If you are in Liguria and you are looking a breathtaking cycling route, you have different possibilities but the best options are two: you can try the cycling route between Levanto and Framura, a 5-km cycling route with splendid views overlooking the sea. This route links Levanto, Bonassola and Framura on the Riviera di Levante, the eastern coast of Liguria (be prepared, it is very romantic). On the western side of the region you can have a ride along Area 24 (24 km long), a cycling route starting in San Remo and running along the coast: the path has been built along the old railway that went from Ospedaletti to San Lorenzo al Mare. Enjoy your cycling tour in Italy!